Today Samsung has made the Galaxy Book2 official. 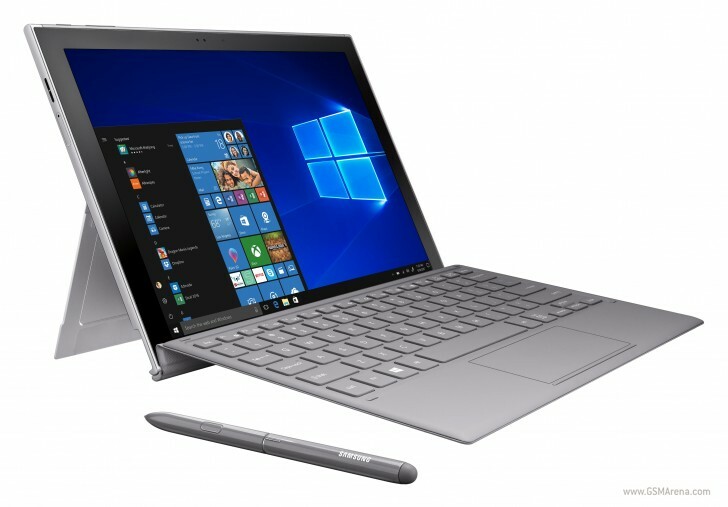 The 2-in-1 is the successor to the original Galaxy Book which was unveiled in February 2017. This device is basically the Korean company's competitor to Microsoft's Surface Pro, but with a twist - it's powered by a Qualcomm SoC, unlike its predecessor which opted for an Intel Core m3. The Snapdragon 850 is at the heart of the Galaxy Book2, which also has a 12-inch 2160x1440 Super AMOLED touchscreen, 4GB of RAM, and 128GB of storage. The integrated X20 modem supports Cat.18 LTE 5CA and up to 4X4 MIMO for Gigabit speeds where available. The Galaxy Book2 has an 8 MP rear camera and a 5 MP front-facing shooter, two speakers tuned by AKG with built-in Dolby Atmos, two USB-C ports, a microSD card slot, a 3.5mm headset jack, Wi-Fi 802.11ac, and it has quoted 20-hour battery life (with adaptive fast charging). It runs Windows 10 in S Mode and comes with an included keyboard and S Pen stylus. It will be available online from AT&T, the Microsoft store, and Samsung.com for $999.99 starting on November 2. Later next month you'll also find it in stores at Sprint, Verizon, and AT&T. Well. Not long ago i told everything Samsung touches they ruin it. They ruined Cell phone industry with their medium to poor quality compared to huge prices. Now they ruin another industry. Well Samsung is a Wrecking ball.